In today’s interconnected, communication dependent world, a cell phone is a vital tool for life. It’s what we use to communicate with loved ones and browse the internet while on the go. It’s how prospective employers reach us, to call us for an interview. In a security or medical emergency, it can be the difference between life and death – between the police or ambulance arriving on time, or not. This is the main reason why the free Cell phones for seniors program was started. A cell phone is a basic necessity nowadays, more so for senior citizens, who are doubly vulnerable. That’s where the Lifeline Assistance comes in -a federal government-sponsored program to help low-income Americans, including those over the age of 65 access reliable, modern phone services, at no cost. The free government cell phones for seniors program provides an easy way for seniors to keep in touch with their loved ones. There is also a guideline to give free cell phones for seniors on Medicare. This has been very beneficial. First established under the Reagan Administration to provide free landline service to qualifying, low-income households, the government has in recent years modernized the free government cell phones for seniors verizon program by providing free cell phones and cell phone service. In the 1990s, the Federal Communications Commission (FCC) set up the Lifeline phone service program funded by Universal Service Fund fees on telephone bills. The program is administered by the Universal Service Administrative Company (USAC), which also oversees the calculation of low-income statistics, determines who qualifies, and how much they get. One applies for Lifeline through one of the government accredited phone or internet participating companies, this free cell phones for seniors verizon application program is done in three easy steps. First, you must show proof that you qualify for Lifeline. A card or award letter to prove participation in a government assistance program (e.g. Medicaid, SNAP etc) or a pay stub or tax return proving your income is at or below 135% of the federal poverty guidelines, will be required. Note: If all your documents are in order, your company will process your application. Please note that you may ask you to fill out additional forms. The third and last step is signing up. If your application is approved, you will receive your Lifeline discount toward your bill. Your company can also apply your discount to an existing service. Who Qualifies Free Cell Phones For Seniors? 1. Eligible citizens are those with an income of 135% or less than the federal poverty guideline based on your household size and state. 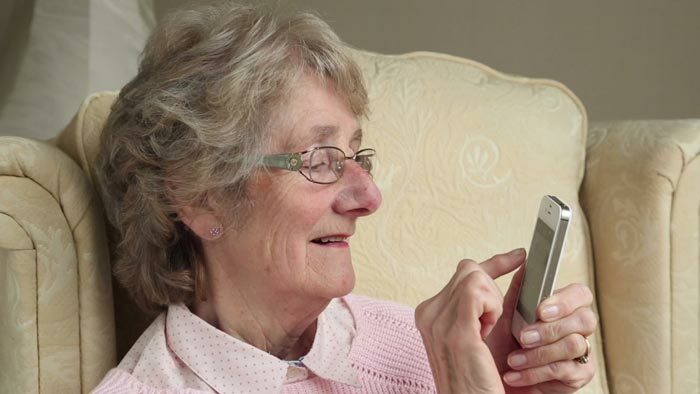 You can help the senior citizen in your life get a cell phone by checking to see if they qualify for a free phone, helping them complete the necessary application, choosing the phone, and signing up for service. In order for seniors to be eligible for Lifeline free or subsidized phone service, they must first see if their state is a federal default state. ReachOut wireless is one of the mobile companies that is offering the Lifeline free cell service. It has a selection of free government phones for users seeking to get the best free government smartphones. The company offers an array of smartphones: Samsung A850, HTC Droid Incredible 2, Motorola Droid 2, and iPhone 4. All these phones are not the latest models of these brands, but they work well. This company has done a lot of work providing free cell phones for seniors. The company offers these devices to users in over 20 states in which it covers. Those people who already have old free government touch screen phones, Reach out wireless gives them an opportunity to upgrade to these newer models for a small fee. This makes it possible for many people to get a Smartphone on the Lifeline program. This is another company that offers its users the chance to enjoy the features of a smartphone in this free cell service plan. The company often ships smartphones and makes them available to users in this program. Users on the program who have basic phones are also given the option to upgrade them once the shipments get in. The best part is Q Link Wireless allows users to use their free mobile data for wifi hotspot services. All users who have hotspot enabled phones can use their monthly broadband data to create a wifi hotspot. They also offer data plans at a cheaper price for users who have exhausted their monthly limit. This is like an unlimited wifi hotspot plan while on a free government cell program. Safelink wireless has the biggest share of users in the free cell service company with over 4million people on this program. It offers free touchscreen government phones to its large clientele. However, the company only provides these free touch screen cell phones to residents of California. Anyone who applies for Safelink free government cell phones for seniors verizon packages with a California address is eligible to get a smartphone as their primary device. For those in the other states, this is not available. It is a rather discriminatory policy that has locked out millions from getting the free touchscreen phones. The Lifeline Calling Plans/Lifeline discounts are available to residents in states where US Cellular is an eligible telecommunications carrier. U.S. Cellular operates a business in 26 states, but only offers Lifeline programs in 15 of those states. They are Iowa, Illinois, Kansas, Maine, Missouri, North Carolina, New Hampshire, Nebraska, Oklahoma, Oregon, Tennessee, Virginia, Washington, Wisconsin, and West Virginia. This is another big player in this market. Assurance wireless is a branch of Virgin mobile that was formed to serve this program. It is one of the companies in this program with the widest national network coverage. The company, like SAfelink, only offers this free touch phone service to California. The rest of the country is denied the opportunity to get a smartphone as their primary gadget. Access Wireless is one of the few companies that were established to exclusively offer free government cell phone service. This company is one of the top players in the industry and offers free touchscreen government phones to those who qualify for the Lifeline program. Some examples of brands they offer include ZTE, Motorola, Samsung, and Alcatel among others. They are among the few companies that offer free touch screen government phones as the first gadget issued to those enrolling. They additionally offer these phones as upgrades to users with basic phones. Access Wireless services are available in over 30 states nationally. You can check their site to see if you can get their service in your area. Life Wireless is a large network that offers free government cell phones for residents of Arkansas, Georgia, Illinois, Louisiana, Maryland, Minnesota, Missouri, Puerto Rico, Rhode Island and West Virginia. Because of Life Wireless broad spectrum of state coverage, it is important that customers verify their eligibility with their home state’s specific requirements. This is a small network company that offers regional service. The company was initially known as Telescope or Surelink. It covers the states of California, Texas, Nevada, Kansas, Missouri, and Kentucky and offers touch phones as their primary gadget. They also have great offers for users living in California and Texas. These subscribers get to enjoy unlimited talk time and unlimited texts for the month. Lifeline is a federal assistance program that allows low-income households to receive discounted telephone services in order to help them make ends meet. This is the backbone of the free cell phones for seniors program. Who is eligible to apply for Lifeline? People whose income is very low less than 135% of the federal poverty guidelines or senior citizens can apply. Free cell phones for seniors, monthly minutes and texts depending on which state you live in. You will get at least $9.25 toward your monthly phone and internet bill. Please note: You can only use a lifeline for either phone or internet, but not both. b) One must be located in an area covered by free government cell phones for seniors Provider. c) Notification of a change in address whenever you move. Who are the Lifeline service providers? How do you get Lifeline? Once you find out that you qualify for the program you need to choose a company in your area. Your company will process your application and you may be required to fill out additional forms. b) If approved you will receive your Lifeline discount toward your bill. The company can also apply your discount to an existing service. What is the free phone like? The phones are recent models, no more than 3 years old in the market, good battery life and convenient for talking. They may incorporate some smartphone features including internet connection, depending on the company one is subscribed to. They are not high-end phones, but some companies may offer options to upgrade at a minor fee of say $20 or $50. How do companies benefit from offering free services? All companies enrolled in the Lifeline program receive reimbursement from the government for services offered. For every free monthly package you receive, the company gets $10 from the government. Free government cell phone companies also get revenue when users purchase extra minutes, texts and data, after exhausting their monthly minutes. Free cell phones for seniors is by far one of the noblest ventures as it provides seniors with a way to keep in touch quite frequently. The program has had quite a tremendous impact in the lives of senior citizens in America. Providing free cell phones for seniors has ensured seniors throughout America have a more comfortable life.